We asked you five questions about Paraguay. Here come the answers! It has different sides. 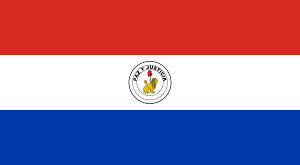 The front or obverse (the side which faces the viewer when the flagstaff is to the left of the flag, and which we’ve shown on the questions page) bears the national coat of arms, a five-pointed gold star surrounded by a palm and olive wreath with the words REPÚBLICA DEL PARAGUAY (Republic of Paraguay). The reverse (shown here) bears the seal of the treasury, a red Phrygian cap on a pole (symbolising liberty) with a gold lion underneath (for courage) and the words PAZ Y JUSTICIA (Peace and Justice). Brazil, Argentina and Uruguay. The war, initially between Brazil and Paraguay only, started in October 1864 after Brazil invaded Uruguay, to which Paraguay was allied at the time. Paraguay’s larger and better organised armed forces gave it early victories but, suspecting the neutral Argentinians of favouring Brazil, it declared war on them as well in May 1865. By September 1866 Paraguay was effectively defeated, but the Allies’ insistence on removing the Paraguayan government meant President Francisco Solano Lopez could not agree to peace. The war dragged on, first as a conventional war and then guerrilla warfare, until Lopez’ assassination in March 1870, by which time some estimates claim that as many as 90 per cent of Paraguayans had lost their lives. It’s taken from the Quechua word chaqu, meaning hunting-ground. The Gran Chaco, a hot, semi-arid and sparsely populated lowland plain, lies mostly in northern Argentina, but the northern third is shared between western Paraguay and south-eastern Bolivia. Coincidentally, the Spanish word chaco translates as “shako” – the tall cylindrical peaked hat worn by many armies during the Napoleonic Wars. Although the Chaco covers 60% of Paraguay’s land area, fewer than two per cent of the population live there. As of 2018, which commodity accounted for half of Paraguay’s exports by value? Soya beans. Unprocessed soya beans formed 39 per cent of exports; soya bean oilcake took up another 6.8%; and another 3.9% was “soya-bean oil crude, whether or not ungummed”. Its largest non-agricultural export is hydroelectric power, where it’s among the world’s top five net exporters thanks to two major dams on the Paraguay River. Guaraní. Extensive intermarriage between European and indigenous Paraguayans mean that well over 90 per cent of Paraguayan are of mixed ethnic background. Over 80% speak both languages, and in fact more people speak Guaraní than Spanish, placing it among the most successful of indigenous languages in Latin America. This entry was posted	on Monday 27 August 2018 at 11:56	and is filed under Quiz answers. You can follow any responses to this entry through the RSS 2.0 feed. You can leave a response, or trackback from your own site.